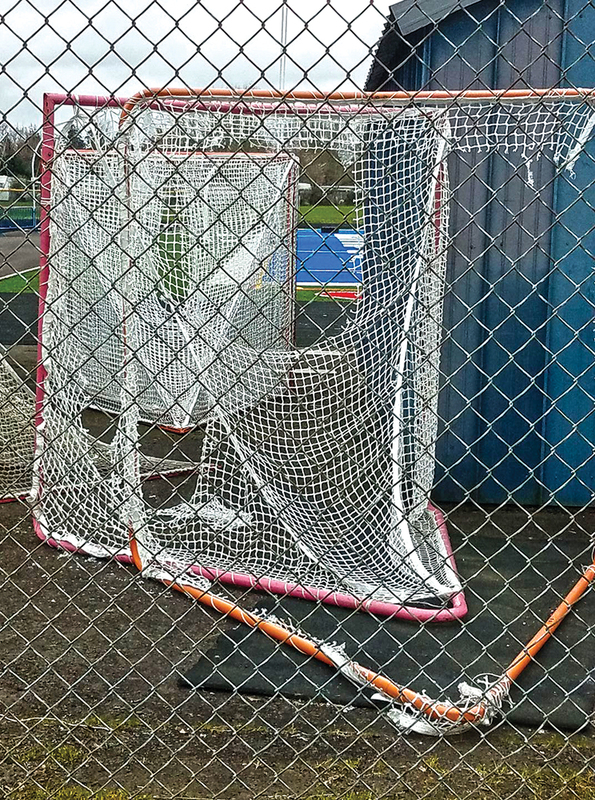 An act of vandalism left the McNary High School lacrosse programs without nets last week, but the incident has turned into a wellspring of support for the teams. Sometime between 5 p.m. on March 30 and 3 p.m. on March 31 someone cut the nets off of eight lacrosse goals. The goals were stored next to sheds near the football field. The nets were valued at about $175 each. Seven of the eight nets were new. At press time, the Keizer Police did not have any suspects, but was continuing to look into the incident along with school officials. “Originally, after seeing the photos, I was too sick to even go look at them. It just made me feel sick to my stomach, thinking about how someone could do that. We were able to repair a couple of our actual game goals. It was our more practice goals, our cheaper ones that just completely got destroyed” said Ryan Bowlby, head coach of the boys lacrosse team. Both the boys and girls teams use the nets that were vandalized. In the wake of the vandalism, a You Care crowdfunding site was created, bit.ly/2oXsefJ, which has already met its goal of $1,275. The club teams also received new nets from some of the lacrosse clubs in Portland as well as Awestruck Lacrosse. Many of the local high schools have offered their back up nets as well. “The biggest impact I saw was how all the community came together really, really quick to help either get us new nets or help provide us funds to be able to replace them,” Bowlby said. School officials are also giving the lacrosse team an indoor, locked space to store the nets and prevent repeat incidents. “Maybe, even in the long run this is going to be better for our program because having the goals out in the weather – 24-7, all-year long – deteriorates them and we end up having to replace them sooner. Now that they’re potentially going to be inside one of the buildings. That’s going to just better their life(span). It’s hard to look at it this way, but I think it may be a good thing that they did get cut. We’re getting a lot of positive things out of it. It was just sickening that someone went out and did that,” Bowlby said. Next boys home game is Friday, April 7, against Thurston. • 2 a.m. – Criminal mischief and vandalism on 1300 block Angie Way N.E. • 5:37 p.m. – Traffic accident with injury on 1600 block Lockhaven Drive N.E. • 12 a.m. – Theft from motor vehicle on 4500 block 18th Court N.E. • 11:38 a.m. – Theft on 300 block Marino Drive N.
• 2:34 p.m. – Assault on 600 block Lockhaven Drive N.E. • 4:46 p.m. – Theft on 600 block Cummings Lane N.
• 9:29 p.m. – Arrest for driving while suspended and traffic accident with injury on 600 block Chemawa Road N.E. • 1 a.m. – Theft from motor vehicle on 100 block Homewood Court N.
• 4:16 p.m. – Shoplifting on 6300 block Ulali Drive N.E. • 4:37 p.m. – Arrest for shoplifting on 6300 block Ulali Drive N.E. • 4:38 p.m. – Traffic accident on Chemawa Road North and River Road North. • 9:53 p.m. – Unlawful possession of marijuana on 6300 block Ulali Drive N.E. • 10:53 p.m. – Arrest for driving while suspended on Bever Drive Northeast and Cherry Avenue Northeast. • 3:20 a.m. – Theft from motor vehicle on 700 block Moneda Court N.
• 7:19 a.m. – Arrest for bench warrant on 5400 block River Road N.
• 10:45 a.m. – Criminal mischief and vandalism on 1700 block Lockhaven Drive N.E. • 1:07 p.m. – Arrest for warrant on 1100 block Clearview Avenue N.E. • 1 p.m. – Arrest for warrant and criminal trespass on 1900 block Chemawa Road N.
• 7 p.m. – Criminal mischief and vandalism on 500 block Chemawa Road N.
• 7:44 p.m. – Arrest for warrant on 800 block Chemawa Road N.E. • 8 p.m. – Theft on 4900 River Road N.
• 1:04 a.m. – Arrest for warrant on River Road North and Maine Avenue Northeast. • 9:30 a.m. – Arrest for warrant and criminal trespass on 300 block Appleblossom Avenue N.
• 11:33 a.m. – Traffic accident on Dearborn Avenue Northeast and Bailey Road Northeast. • 2:58 p.m. – Criminal trespass on 6400 block Keizer Station Boulevard N.E. • 3 p.m. – Theft from motor vehicle, unlawful entry of vehicle, and intent to commit theft on 1400 block Bright Court N.E. • 3:15 p.m. – Graffiti on Chemawa Road North and Delight Street North. • 3:30 p.m. – Failure to perform duties of driver when property is damaged on 6700 block Field of Dreams Way N.E. • 5:12 p.m. – Arrest for criminal mischief, vandalism, disorderly conduct, and criminal trespass on 4900 block River Road N.
• 7:50 p.m. – Unlawful entry to vehicle with intent to commit theft and theft from motor vehicle on 5000 block River Road N.
• 11 p.m. – Theft, criminal mischief, and crime damage on 5400 block River Road N.
• 12:14 a.m. – Arrest for driving under the influence of intoxicants on River Road North and Hollyhock Place North. • 2:35 a.m. – Arrest for driving while suspended and under the influence of intoxicants on River Road North and Sam Orcutt Way N.E. • 7:49 p.m. – Theft on 5400 block River Road N.
• 10:39 p.m. – Criminal trespass on 3500 block River Road N.
• 9 a.m. – Initiate false report on Cherry Avenue Northeast and Candlewood Drive Northeast. • 5:20 p.m. – Arrest for strangulation and assault on Keizer Road Northeast and Hasbrook Avenue Northeast.